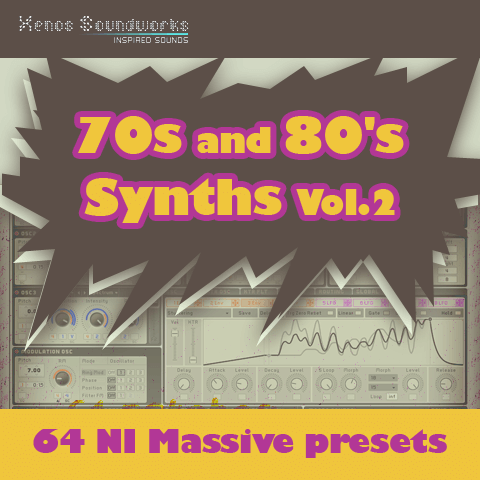 ’70s and 80s Synths Volume 2′ is our second collection of 64 vintage style sounds for Native Instruments Massive. Great care was taken this time around to provide a “warmer” side to Massive with subtle extra programming, offseting the synth’s naturally sharp character. All 8 Macros are intelligently assigned to each patch for maximum variation and expression. Please note that these presets are in NMSV format only. Bryan ‘Xenos’ Lee has worked as a sound designer for such companies as Native Instruments, Cakewalk, Rob Papen Inspiration Soundware, ReFX, Camel Audio, Image-Line and many more. His work is found in several Maschine expansions and the factory presets of such synths as Z3ta 2, Kontour, Alchemy, Gladiator, Punch, Toxic Biohazard, Scanned Synth Pro 2, Chipsounds, DCAM Synth Squad, D.I.V.A., etc. He is also very active in developing his own brand, Xenos Soundworks.